‘Tis the season to think about Advent Calendars again already. Can you believe it? And, since there are so many folks who love the idea of creating things themselves, but love quick and easy… we’ve got ideas for you! The totally fun gift-style Advent Calendar goodie bags you see above are perfecto! Stuff them with treats, tiny toys, lip gloss or even tiny sheets of paper with fun things written on them to do. Things like “make gingerbread cookies today” or “go sledding”. Just about any fun thing will do. Birthday Bash Week Project Idea 5: It’s a Holiday Blog Hop! Shown above is a sneak peek of what you’ll find on Lisa Graham’s stop on the blog hop – you’ll be linked to it, along with full instructions, as you hop through the Blog Hop! Happy Friday! Today’s the final day in our spectacular Birthay Bash week! REMINDER: all Birthday Bash promotions (Golden Ticket chance, free shipping, free stickers, etc.) end at 3 PM CT today, Friday November 6. 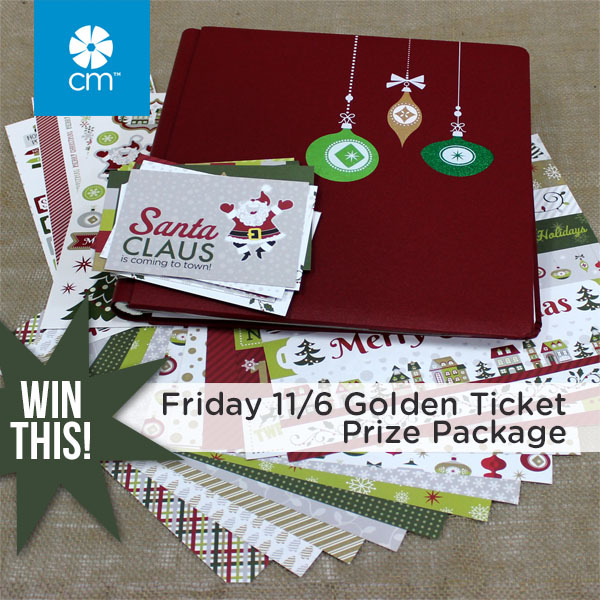 Today’s Golden Ticket Prize Package features another collection of fab holiday products, including the Christmas Joy Fast2Fab Album, Paper Pack, Slide-In Pack and Stickers! By simply placing an order today, you could win the entire package and be ready for the holidays! Reminder: to qualify to win this, you simply need to place an order today (Friday, November 6). You’ll also receive FREE Days of Fall Title Stickers and FREE shipping on orders over $75! Birthday Bash Week Project Idea 4: Holiday themed layouts, embellishments & borders! Happy Thursday and day #4 in our Birthday Bash week! 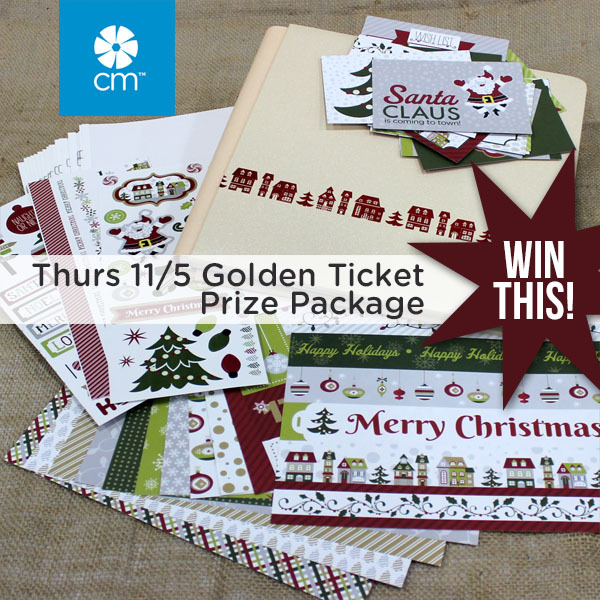 Today’s Golden Ticket Prize Package features stunning new holiday products, including the Home for the Holidays Cream Mica Coverset with White Pages and Protectors along with Christmas Joy Paper Pack, Slide-In Pack and Stickers! By simply placing an order today, you could win the entire package and be all set to celebrate the holidays in style! Reminder: to qualify to win this, you simply need to place an order today (Thursday, Nov. 5). You’ll also receive FREE Days of Fall Title Stickers and FREE shipping on orders over $75! Birthday Bash Week Project Idea 3: Holiday Themed Border Mania! Happy Wednesday and day #3 in our Birthday Bash week that’s proving to be a smash hit! 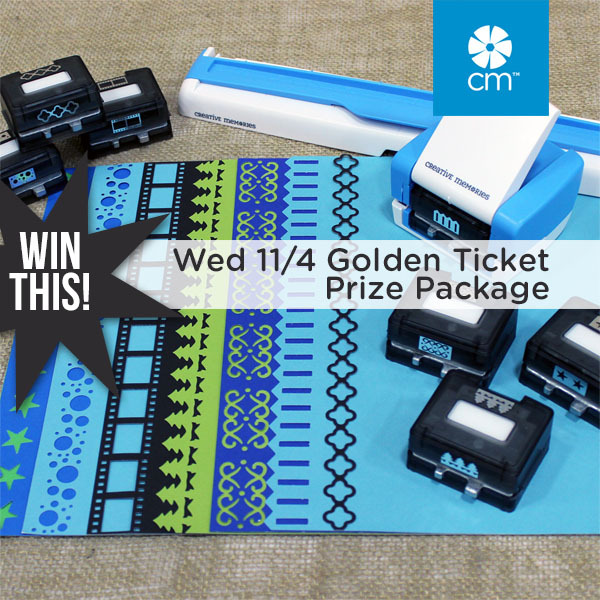 Today’s Golden Ticket Prize Package features our beloved Original Border Maker System (which includes the Picket Fence Border Maker Cartridge) plus every cartridge we’ve got in our line: Bubbles, Star, Filmstrip, Medallion Frame Chain, Diamond Scroll and new Evergreen! By simply placing an order today, you could win the whole set and become a border making master! Reminder: to qualify to win this, you simply need to place an order today (Wednesday, Nov. 4). You’ll also receive totally fun Days of Fall Title Stickers FREE with any order placed, and enjoy free shipping on all orders over $75. Birthday Bash Week Project Idea 2: Fall Page Layouts you’ll love! Happy Tuesday, and day #2 in our Birthday Bash week loaded with goodies! 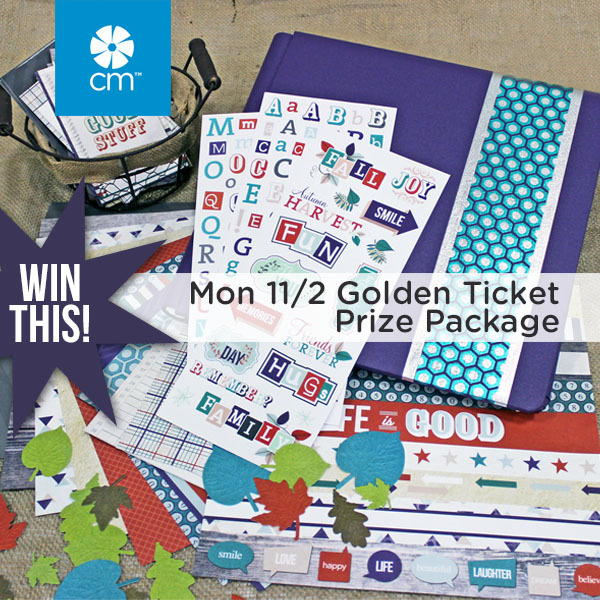 Today’s Golden Ticket Prize Package features more items from the Fall In product line, along with some beautifully coordinating bookcloth Album Covers plus white pages and protectors and Multi-Pocket Pages. Have a peek at this great stuff you could win simply by placing an order today! Oh, and don’t forget – free shipping on all orders over $75, plus we’ll throw in a free set of Days of Fall Title Stickers, too! Birthday Bash Week Project Idea 1: Page Borders to Fall In love with! Happy Birthday to us! This week, we’re turning 1 and we are celebrating in a big way! Each day this week, we’ll be sharing some totally creative project ideas on our blog. 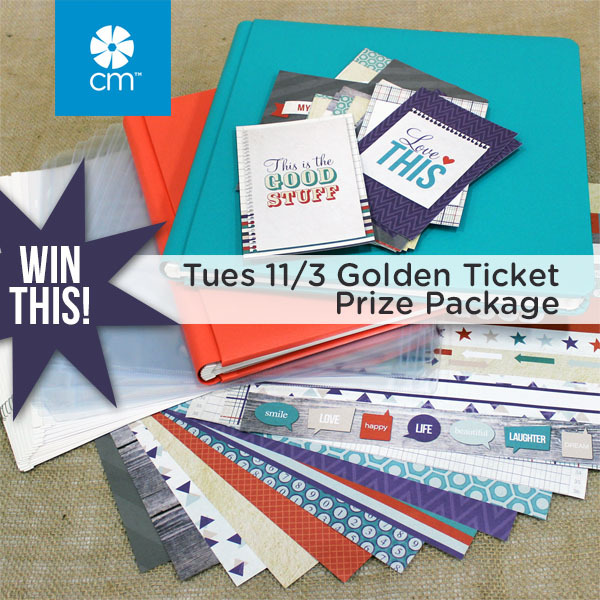 And, what’s even better is that we’ll be randomly inserting a Golden Ticket into 3 random orders each day. If you are a lucky winner and find a ticket in your order, follow the instructions on the ticket to claim your prize!